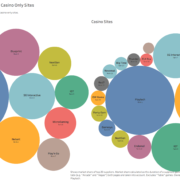 Online game developers frequently release new casino titles, often at a frequency of least one game a month. Developing, marketing and integrating these new games onto operator sites no doubt takes up significant resources. Which begs the question, why release new games so often? Operators of course like to keep their offering fresh, with new games always available for returning customers to try. Additionally, if their competitors are offering fresh content, they don’t want to be left behind, thus the demand for new games from is always consistently strong across all operators. With casino sites regularly releasing new games regularly, it is inevitable that this will reduce the exposure of pre-existing content on the site. Their prominent position on the casino page will inevitably diminish with a likely loss in revenue. So these games effectively ‘churn’ from the top positions. We provide monthly top slot rankings to our clients every month, and after a few months of doing this, it became evident just how much their games churn. We found that of the top 20 ranked games each month, at least 50% of these would leave these top positions on the pages by the following month. 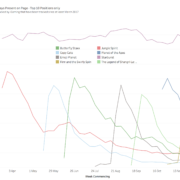 The following analysis looks at two major game releases and how their exposure on operators’ main casino pages changes over time from their release date. We also look at new game releases from one supplier and see an interesting pattern. We chose Phantom of The Opera by Microgaming and Planet of The Apes by NetEnt as they were released within a week of each other and both had a wide distribution across multiple sites and countries. Both releases were also heavily marketed in the trade press, social media and at trade fairs. Casino sites all have different mixes of games suppliers. For the analysis, we chose 32 casino pages where both games were present (though interestingly when we did the same analysis for all pages, regardless of whether both games were present, the results were similar). We selected the main landing pages on the casino sites, as these pages are where new games releases are featured most prominently and where the majority of the revenue is driven from. The list of casino pages and the country in which these pages were tracked can be found at the bottom of this article. The graph below shows the weekly average position of each game aggregated over the casino pages. Both games follow a similar pattern: the average position peaks in the first weeks and then gradually declines. Planet of The Apes maintained high positions for the first five weeks then dropped away at a rapid rate. The Phantom of The Opera started to fall away from the third week onwards. Its average position declined at a slower rate but always occupied a lower position than Planet Of The Apes. In some instances, the games will disappear from certain casino pages after just a few weeks. 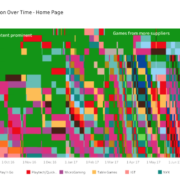 The next chart looks at the exposure of the game in a different way – the number of aggregated days the game is present on all the pages analysed, so this graph shows total exposure across all the sites. The results display a similar pattern. Planet Of The Apes peaks at week two and its presence remains high over four weeks, then it starts to decline. The Phantom of The Opera starts to fall away after three weeks. What is striking is that once the games’ presence on the sites starts to decline, they seem to do so at broadly the same rate. When you run the same analysis, but only taking into account the top 10 positions of each page, the pattern of decline remains. 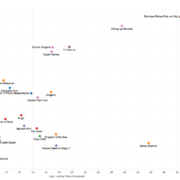 However, it is clear that Planet Of The Apes is more popular and shows more strongly in the higher positions across the tracked sites compared to Phantom Of The Opera. So why do the positions decline and follow this pattern? Usually it’s to make way for new game releases, as only a few games are truly ‘sticky’, i.e. they have enough popularity to remain prominent on the page. Examples include Starburst by NetEnt, Rainbow Riches by SG Interactive and Book of Dead by Play’n Go. What about games from the same supplier? 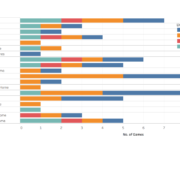 The last three charts looked at two games from different games suppliers, but what about games from the same supplier? The following chart shows the average positions of seven recent game releases from NetEnt. You would expect that each time a game is released by NetEnt, the exposure on the tracked sites would be similar due to their relationship with these operators. The drop off from that point will be, in the majority of cases, due to the games’ success relative to other content. As you can see from the below, there is a pattern for game launches from individual suppliers. Planet of The Apes is just one of a series of NetEnt releases in the last six months. The exposure on main casino pages follows a predictable pattern. They rank highly in the top positions for a couple of weeks then drop off sharply, to be replaced shortly after by the next games release. You will see one notable exception to this rule on the chart above – Starburst. This has more aggregated days in the top positions each week than any of the games in their launch week. The enduring popularity and traction of this game is clearly something that NetEnt, and all other game producers for that matter, are striving to emulate. The time a slot takes to load is a key customer service KPI in online casino. In this month’s exclusive analysis for iGaming Business, Ken Muir from iGaming Tracker analyses the loading performance of four popular titles from NetEnt, Play’n’Go, SG Interactive and Yggdrasil across six leading online casino sites – Bet365, LeoVegas, Mr Green, Sky Vegas, Unibet and William Hill. One of the most common customer complaints in an online casino is that a game loads slowly or fails to load. The reasons behind slow loading times can be difficult to ascertain, as they can be many and varied. It could be the customer’s bandwidth connection, it could be problems with the website or with the gaming platform hosting the game, or it could even be the game itself. We work with clients to try and understand the scale of the problem and establish why it is happening. In this article, we will analyse the game loading times of four popular casino games – Play’n GO’s Book of Dead, SG Interactive’s Rainbow Riches Pick’n’Mix, NetEnt’s Starburst and Yggdrasil’s Vikings Go Bezerk, each launched from a different selection of four operator sites. The operator sites used in this study were Bet365, LeoVegas, Mr Green, Sky Vegas, Unibet and William Hill. To be clear, the analysis is only of the loading times of successful game loads; it ignores any failed attempts to load the game (we have found that generally 1-2% of load attempts fail). As you can see from the table below, the games and sites tested are a representative mix of popular games and casino sites. The tests were carried out between 4 November and 12 November, 2017 in a controlled environment with consistent bandwidth connection. This approach eliminates any issues with the customer’s bandwidth speed. Testing the game over several sites helps us understand the performance of the gaming platform as well as of the individual casinos. By looking at the overall average game loading time, as well as the file size, we can understand the differences between the games and the sites. As you would expect, there is a direct relationship between the game file size and the game load time. However, there are games that under- and over-perform compared to their file size. The chart below clearly shows the different approaches games suppliers adopt with regards to the file size of their games. Starburst by NetEnt has a small file size and consequently a short average loading time. Likewise, Book Of Dead has a relatively small file size and a proportionate loading time. However, Vikings Go Bezerk has a much higher file size typical for Yggdrasil games, but the game loading time is much shorter than you would expect. The graph below shows the load times per test by game. The horizontal axis shows the loading time on an uncached browser, while the vertical axis shows the second part of the test, testing the game loading time with the game cached in the browser.In the tests, we throttled the bandwidth speed to a typical home broadband speed to make the tests realistic and consistent. As you can see, there are different time distributions for each game. This seems to have affected Rainbow Riches Pick’n’Mix to a significant degree. As we have seen, there is a direct relationship between file size and game loading time. However, the operator site also affects the performance, and our testing the games on different sites produced some interesting results. Book of Dead – Bet365 gave consistently better loading times for this game, with Leo Vegas, Mr Green and Unibet clustered closer together. The graph below clearly shows the amount of ‘outliers’, where a significant proportion of game loads resulted in abnormal load times. Unfortunately, this is not unusual. Starburst – as with Book Of Dead, Bet 365 has consistent and short loading times, as does Leo Vegas. At the other end of the spectrum, William Hill has slightly longer and more erratic loading times. Vikings Go Bezerk – this Yggdrasil game has much more consistent loading times than others, although they are longer due to their file size. The game loading times between the various casinos do not seem to differ to any degree. Rainbow Riches Pick’n Mix – this SG Interactive game possesses a large file size, and the LeoVegas and Bet365 sites seemed able to handle this better than William Hill. The results for Sky were also much higher for the same test. This level of performance is not typical for Sky Vegas based on the tests we performed for other games on the site, but the large file size of this particular game and the bandwidth speed seems to have affected Sky Vegas disproportionately more than the other casinos. 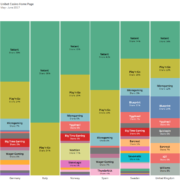 This analysis took in a small sample of games across a small sample of online casinos. However, it does illustrate that on a key customer service KPI – the time a slot takes to load – marked differences exist between games and casinos. Some may say it’s only a matter of few seconds and the games always end up loading anyway, but these differences give a strong indication of the attention developers and casinos pay to their service levels. On this basis, it is therefore not surprising that the shortest and most consistent loading times are for the most popular slot game, Starburst, on the most popular website, Bet365. This month iGaming Tracker’s Ken Muir explores the rise of casino live gaming and the respective roles played by Playtech and Evolution. There has been a lot of interest in casino live gaming in recent months. Playtech has recently completed its migration of dedicated live casino rooms to its next generation studio in Riga, Latvia. In July, we identified a game launch that had equivalent exposure to a major new slot release. It was surprising to us that it was actually a new live game format from Evolution, albeit a take on a traditional casino Wheel of Fortune format, called Dream Catcher. Most online casinos have a live casino offering on their live casino tab, however at iGaming Tracker we have noticed that most landing pages now have live games present, along with standard HTML5/Flash table games and the top slots. 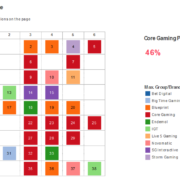 The above chart looks at the percentage mix between slots vs. live casino games vs. table games (HTML5/Flash games such as roulette, blackjack etc). Most pages have some presence of casino live games, and when they don’t have live games it looks like it is due to exposure on another casino tab. For example, Sky Vegas doesn’t have a live casino game presence, but live games have a large presence on Sky Casino (Playtech exclusive). It seems that most casinos have an exclusive agreement with either Evolution or Playtech. All but one of the casinos analysed had live games exclusive to one supplier on their main page, even if they were offering slots games from multiple suppliers on the same page. The chart shows the type of live games on the main page. Interestingly there is a healthy mix of games, and often multiple options of roulette and blackjack. In July, Dream Catcher rapidly started to appear prominently on many casino main pages. The game by Evolution is not a traditional live casino game, taking its inspiration from a Wheel of Fortune game. This type of game builds a community feel into the casino live experience; consequently the game is likely to be more sticky than a typical slot game release. The graph below shows the positions on each page since its release. It is likely that Dream Catcher will be the first of several new format live games which start to compete in the same space as casino slot games.